Last week, I tried my first predictions article, and honestly, it did not go all that well. I didn’t predict that every member on Alliance would score 50+ points, I didn’t say Celaver would get 50+ points, I didn’t say that NA wouldn’t have a top fantasy point scorer in the top 11. But I did find out one thing, my prediction methods are extremely accurate and reasonably precise. If you are unsure of the difference between accurate and precise check out the wikipedia page because I will be discussing those two terms quite a bit. It may sound confusing, considering that EU in general did a lot better than expected and NA in general did a little bit worse than expected, but I was extremely accurate and precise. Overall, I was at a respectable 12.45% (in)accuracy (closest to 0 is best) and I was at +/- 8.2 points precise. I mentioned in my previous article that I was also working on a different method for prediction and I finished it just before the games on Thursday. That method came out to be 9.29% accurate and +/- 8.4 points precise. From here on, I will refer to both predictions methods as M1 (method 1) and M2 (method 2), respectively. Naturally, I wanted to see where I went wrong, so I split up my data to look at EU and NA separately. For M1, EU was 22.02% accurate and +/- 9.9 points precise and NA was a wonderful 3.87% accurate and +/- 6.6 points precise. M2 had EU at 20.65% accurate and +/- 9.8 points precise with NA at an astounding -0.89% accuracy and +/-7.2 points precise. That accuracy and precision for NA is insane! Especially since I am using only 40 games of data to predict the outcome of 8 games. However, something went wrong in EU. So I looked at something that was obvious about last week’s games. They were all extremely long. In fact, they were 15% longer than the average game length in EU for the previous 4 weeks. I checked the projected points total vs the actual points total, and surprise surprise, there was a 17% point increase in EU compared to my projected point totals via M2. But is it just a coincidence? I checked with NA’s totals and got a very similar relationship. NA’s games were slightly shorter than usual (5.3% less game time than previous 4 weeks) and they also scored less points than M2 projected for them that week. In fact, NA scored 4.2% less points than predicted. As of right now, it looks like there is a direct 1:1 correlation between amount of game-time and amount of points scored. For week 6, I decided to share M2 with you guys instead of M1 due to M2 performing better after the first week. I will provide both methods score tables at the end of this article however and due to popular demand I will continue providing the tables at the end of each article. But now, I should discuss the top 3 of each position once again. SOAZ (and Fnatic) once again will be extremely prominent in the top 3 for this week. Last week they performed a little bit worse than expected mostly due to being controlled and bullied in their last game against Millenium. However, this week, Fnatic will be playing against the second best possible schedule of SHC and CW (the best is GMB and CW). EU has consistently scored more points than NA due to longer game times, and Fnatic failing to quickly close out games gives their players a lot of points. I would be lying if I said that YoungBuck’s score wasn’t inflated due to his extremely impressive performance last weekend. I would continue to be lying if I said his score wasn’t inflated due to how long CW games go. And I would continue to be a liar if I told you to not start YoungBuck in this upcoming week. He plays Gambit and Fnatic, and all three of those teams (CW, FNC, GMB) have trouble closing out games. Expect some long games and a lot of kills. The first of 3 “European” junglers on this top 3 list is Airwaks. Airwaks received a lot of criticism at the start of the season when he kept trying to make junglers like Yorick work, but now that he is playing “real” junglers, Airwaks has been contributing a lot of kills to both teams. He leads both NA and EU LCS in deaths at 59 on the season, but he also leads junglers from both NA and EU LCS with 34 kills. Both are impressive statistics considering he has played 1 less game than them (FF) and he played a couple games as Yorick jungle. As I said in previously, Fnatic has the 2nd best schedule to go against if you want to receive fantasy points. Cyanide has continued to show promise and has continued to perform well throughout his many seasons being a pro player. Obviously, Fnatic will always be Fnatic (perhaps Aranaea can change things and make them more consistent) so we never know how they will do on a week-to-week basis, but I feel pretty confident in Fnatic’s abilities this week. Another Fnatic player in the top 2, and again it is due to Fnatic’s inability to close out games and the fact that they are all really talented players. The question with Fnatic is, and always has been whether or not they will show up to a game (preferrably not hungover). I believe in them this week, but it is understandable if you have doubts. The British crowd said it best: “AWOOOOOOOOOOOOOOOOOOOOO”. Copenhagen Wolves has shown time and time again that they will somehow manage to make every game they play their own version of a Call of Duty Team Deathmatch. Kills are abundant in every CW game for both them and their opponents. This really showed when they managed to stay competitive in the Alliance game last weekend. It’s Rekkles. Fnatic plays good fantasy teams this week. He always does well even if Fnatic loses. No risk and a LOT of reward coming from the guy. On a side note, this is the first player I’ve predicted to get over 50 points in a week. This guy is like Rekkles Jr. Except that he does amazing (just like the rest of his team) when he loses. He will consistently do amazing for every team that has him, and CW has no plans to hide that he is the star of the team with picks like Kog’Maw consistently going to him and YoungBuck picking up Vladimir to increase Woolite’s damage. 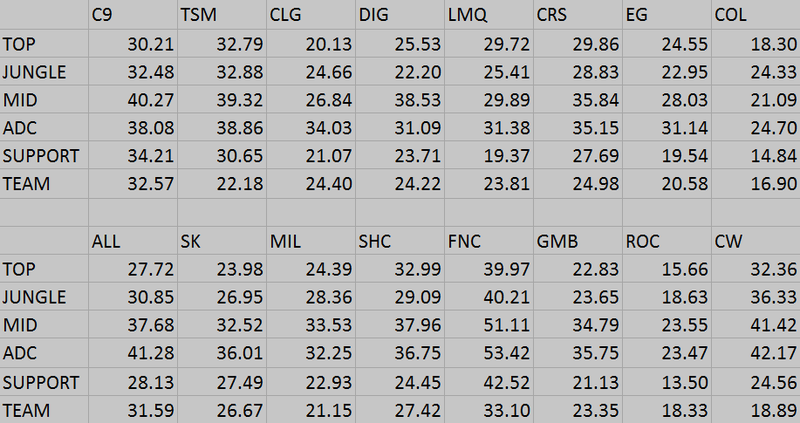 The last of the Fnatic players is finally listed, and it shows how much of a role scheduling can have in determining how well players will do, or at least in how it is factored into my calculations. Firstly, it should be noted that you should not start only Fnatic players because all it would take is one bad game to cause you to lose your matchup for the weekend. The first major rule of good investing is diversification, which means not keeping all your eggs in one basket, or in this case, starting everyone from the same team. Back to Yellowstar, he will do really well if Fnatic starts rolling, but if Fnatic is in a close game or in a losing situation, Yellowstar will end up dying a lot in order to save the rest of his team. This is a rehash of last week, but what I said still holds true. Fnatic has had a great schedule the past couple weeks for fantasy, but once they go back to Alliance, Roccat, and SK they will have a tougher time scoring. This is the biggest risk in the entire article. Gleeb does amazingly when TSM wins a lot (see week 1) but when TSM loses or does poorly, he will net you negative points. TSM is the best definition (when ignoring coL) of big winners and bad losers where they score 334% more points when they win compared to when they lose. For comparison, the team a lot of people think scores big on wins and is worthless on losses is LMQ and they only have a 249% increase in points. I would avoid Gleeb this week. His schedule is too tough. Fnatic continues its reign of terror in the top 3 by being the highest projected team for this upcoming week. As we found out last week, team projections are actually extremely conservative and should be up to you to decide who you think is going to win 2 games in the upcoming week. Alliance is still my #1. Cloud9 joins CRS by playing coL and EG this week. Historically they haven’t done so well against these two teams, but expect them to not take them likely in their 2nd matchup. I expect C9 to go 2-0 this week so I feel they are closer to ~40 rather than 29. Overall, I am really surprised by how well my first two iterations of my method are. Obviously, it will never be 100% accurate because if it were, then there would be no point in playing the LCS games and Riot would just rely on my data to determine who will win each game. As promised, here are the two tables for each player here for M1, and here for M2. Thanks for reading! Hope this helps for this week!